You will be required to sign the waiver below before we embark on the walking tour. You may print this out, sign it and bring it with you if you’d like. Otherwise, waivers will be available there for you. You will then get to take home a Roswell Ghost Tour souvenir pen! 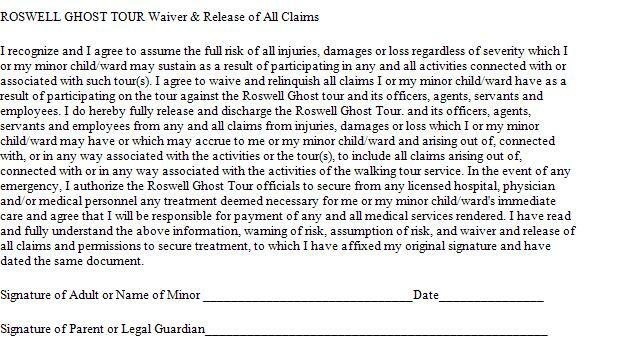 It is imperative that minors who drive themselves or simply wish to take the tour without parents/guardians have a pre-signed waiver by their parent/guardian to attend the Roswell Ghost Tour.